Today’s forex analysis for the usd to cad pair starts with the candle which replicated that of Monday in that it ended the trading session on a narrow spread body but with a deep upper wick, the only difference between the two that one was an up bar and the other a down bar. The common feature of both candles is that the upper shadow represents weakness in the move, and in addition the highs of each day failed to breach the 40 day moving average which now seems to be providing a barrier to any further move higher. Given the relatively weak technical analysis on the daily chart my trading suggestion for tomorrow is to look for small shorts using the 30 min chart for suitable entry and exit points. 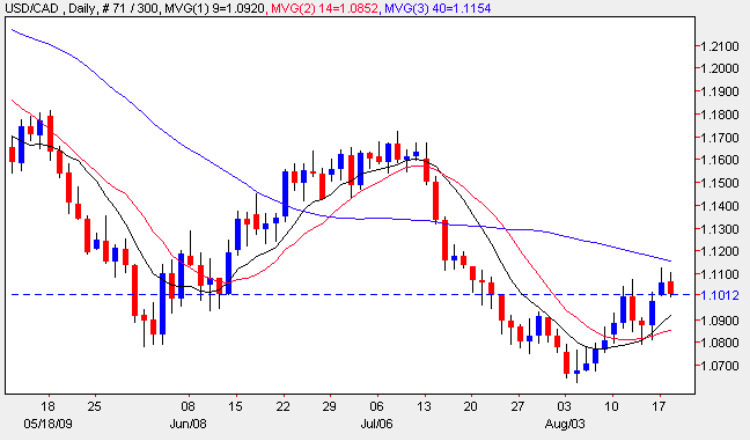 However, trading this pair may be complicated by the raft of fundamental forex news which is detailed below. The first major piece of fundamental news on the economic calendar for the Loonie is Core CPI which is forecast at 0.1% against a previous of 0%. Core CPI measures the change in the price of goods and services but excludes the 8 most volatile items as they tend to distort the underlying trend. The reason this data is important to us as forex traders is that the Bank of Canada considers this a key component of their decision making process for interest rates. The CPI numbers are released at the same time and these are forecast at -0.2% against a previous of -0.3%. Finally in Canada we have the Leading Index, a less significant data set, which is based on a composite index of 10 indicators and designed to predict the direction of the economy. However, the effect on the forex market is relatively muted as all the indicators have generally been digested in previous announcements. Meantime in the US the only item of significance is the Crude Oil Inventories which tends to have more of an impact on the more risk senstive currencies such as the Euro as well as the CommDollars.